During the Victorian era, Christopher Dresser vigorously designed household objects in a multitude of materials. He designed ceramics, metal, glass, and much more. This versatility was part of his brilliance as a commercial designer. While paying attention to both ornament and form throughout his career, Dresser’s attention shifted more toward form after visiting Japan in 1876–77. Yet this jug shows his predilection for form before that time. 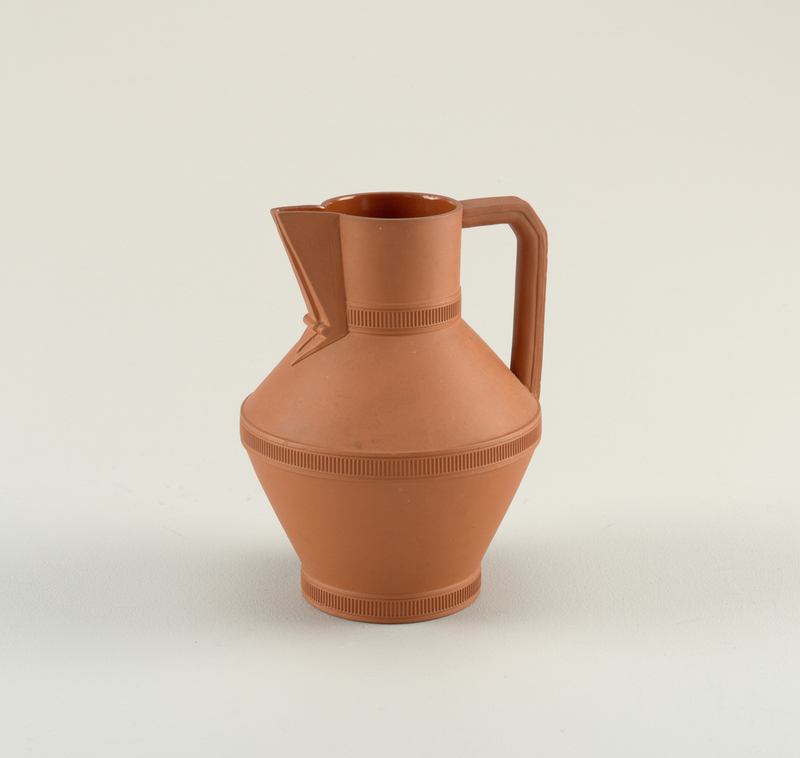 Dating from 1872, the jug was inspired by the forms of classical terracotta vessels, such as oinochoes (wine jugs) and vases. This jug is an example of his work for the Watcombe Pottery Co. in Torquay—a seaside town in Devon, England—and exemplifies the pottery’s specialization in wares inspired by antiquity. Watcombe further referenced antiquity through the use of the region’s local red clay, which was often emphasized through minimal decoration. Sparingly decorated with slender bands of vertical reeding, this jug’s smooth terracotta body draws attention to both its visual simplicity and materiality. A Watcombe vase by Dresser in the Victoria and Albert Museum’s collection in London has a modest amount of gilded and blue decoration, which aptly contrasts with the vase’s red body. Comparably, other examples of this jug by Dresser for Watcombe show a similar type of decoration. An example of this appears in the catalog of the 2004 exhibition Shock of the Old: Christopher Dresser which was shown at both Cooper Hewitt and the Victoria and Albert that year. In spite of its classical inspiration, this jug could easily be described as proto-modern—a term often used for describing Dresser’s designs—because of the jug’s uncomplicated decoration and angular handle and spout. However, Dresser’s straightforward interpretation of classical form also alludes to utility and functionality, which is inherent in the global history of ceramics.